Show Us Your Cell Tower Pictures. We want to see your cell tower pictures and rooftop cell site images. Cell tower hunters, we know you are out there. Although we are a consulting firm focused on the negotiation of cell site leases, we encourage all of our visitors to send us cell site pictures from any location. It's easy, just upload it, tell us about where the site is located or a little bit about the cell site, and post it to our blog and after we approve the photo you image will appear on our site usually with a few hours. Cell Tower Hunters >> Upload Your Cell Tower Pictures and Rooftop Cellular Site Images ! Are you a cell tower hunter? Do you snap pictures of cellular towers or rooftop cellular sites? You can come out of the closet, it's OK. Do you work in the industry and have a great story to share about a cellular site? Share your cellular site picture and story! Are you an angry citizen who hates cell towers? Are you an electrician who has to climb these things for a living? Are you an overweight real estate site acquisition manager who has to walk up many flights of stairs every day to take pictures of rooftop cell site locations? Are you an RF engineer who is afraid of heights? Are you a landlord or property owner who collects thousands of dollars on their antenna lease every month? Let's see those cell tower pictures. Your cell tower hunter picture and story will appear on a Web page exactly the way you enter it here. 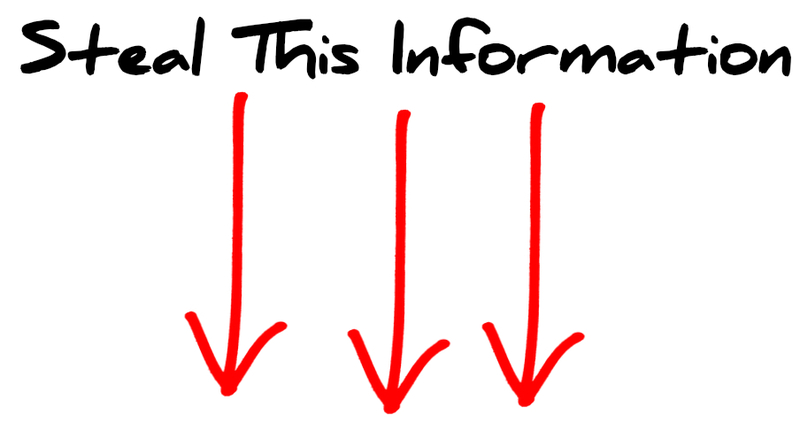 TIP: You can write about Who, What , Where, When, Why and How. Your cell site image can be a monopole, lattice tower, stealth (disguised) cell tower, guyed cell site, billboard site, rooftop cell site, cactus, palm tree, pine tree, flagpole, etc. Put those smart-phones to use, but please drive safely if you snap a photo of a cell tower from a moving car on your cell phone. Uploading your cell tower picture is easy. Click the upload button and find it on your computer. Then select it. New tower that is yet to "go live!" June 2018. Idaho County, ID cell towers at Christmas. New Monopine in Leesburg Owned by SBA with two carriers (AT&T & T-Mobile with a third constructing now). I like cell towers because they are electric, they are cool, that's it. And it has 4 carriers. Rogers Wireless lattice cell tower on the corner or Mandaumin Rd. and London Line. Very interesting cell site on Route 208 North near the Ewing Avenue Exit in Franklin Lakes, New Jersey. I snapped a photo heading Southbound. Wonder why they can't hear me now. Stealth Bell Tower Cell Site in a graveyard. This tower is a Sprint PCS, and T-mobile Cellular Tower. Small Rogers Wireless cellular tower located right next to the 402 Hwy in Sarnia, Ontario. Telus (Mike) Mobility MHz up top. Bell Mobility UMTS panels below. Located at the Highbury Rd. S. exit off of the 401 Highway in London, Ontario. I believe Telus Mobility is up top. Mike antennas are second and Rogers Wireless is the third set. Located on the eastern part of London, Ontario. Bell Mobility CDMA and UMTS panels located right by Cherryhill Mall in London, Ontario. Note the DC power boxes attached to the UMTS antennas. Formerly CDMA. But now I believe this Bell Mobility site has just strictly Bellus UMTS antennas attached. Located West outside of Forest, Ontario. Bell Mobility CDMA setup located on top of an apartment building on the corner of Base Line Rd. and McGregor Ave.
Nice job on the camo. 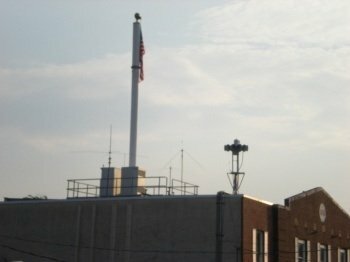 If required by the town, the carriers can make the antennas blend in with the building. 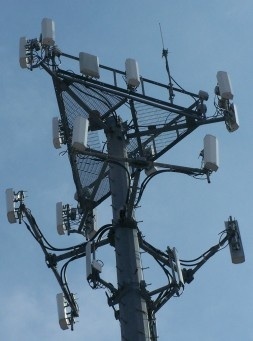 This is a picture of a cell tower in Freehold New Jersey. I guess there is a website for everything these days, Did I win something? Upper East Side of Manhattan rooftop antenna site. 6 1900 MHz antennas for Telus Mobility. These are located on the eastern part of an apartment building in London, Ontario. Rogers Wireless lattice cell tower site located just east of Courtright, Ontario. Mike (Telus) antennas on top and Bellus UMTS panels located underneath. Cellular site located on the Southeastern part of Grand Bend, Ontario. Small Mike (Telus) omni site located on Watt St. in the central Western part of Forest, Ontario. Downtown Galway City rooftop cell site. Photograph of cellular phone tower off in distance at sunset. Questions About Cell Tower Pictures? >> Contact Tower Genius. Tower Genius is a wireless telecommunications consulting firm that assists wireless landlords in negotiating cell site leases in the United States.